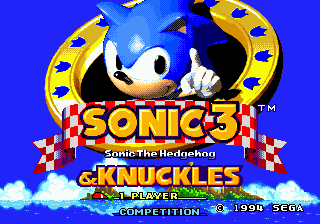 Sonic 3 & Knuckles is a game that results when Sonic 3 is locked-on to Sonic & Knuckles via Lock-On Technology. It acts as one large combined game and all the levels from Sonic 3 and Sonic & Knuckles become available. In Sonic Classic Collection, for unknown reasons, the game was renamed to Knuckles in Sonic 3. There are several noticeable differences when playing the games combined. Knuckles is playable in the Sonic 3 levels and Tails becomes available in the Sonic & Knuckles levels. Also, all of the levels from both games are accessible, starting from Sonic 3. Once these levels are completed the Death Egg falls off screen intact instead of being destroyed, and then the play continues straight to the levels of Sonic & Knuckles. The final boss of Sonic 3 is also omitted for Sonic and Tails. After collecting all the Chaos Emeralds of Sonic 3 a new quest becomes available when entering the first Giant Ring in Mushroom Hill Zone, which allows you to collect seven new Emeralds called "Super Emeralds" through a special stage hub world in Hidden Palace Zone. When these Emeralds are collected, Sonic can transform into Hyper Sonic and Knuckles can transform into Hyper Knuckles. Tails has no Hyper form, but the Super Emeralds are needed for him to transform into Super Tails, as the Chaos Emeralds alone have no effect on him. There are also several other notable differences when playing these two combined games. Game progress can be saved in Sonic & Knuckles by using Sonic 3's save feature (there are now 8 save slots instead of 6). Save slots now display information about continues and lives remaining. It also shows the amount of Emeralds collected. The music used in Sonic & Knuckles is used in the combined game. Thus, the songs that were different between Sonic 3 and Sonic & Knuckles (which include the title screen, 1-up, and invincibility sounds, as well as the mid-level boss music, Knuckles' theme and end credits theme) play the Sonic & Knuckles version. Passing a star post makes all 3 Bonus Stages from both games available, including the slot machine stage (20-34 rings required), magnetic orbs stage (35–49 rings required), and the gumball machine (50–65 rings required). Knuckles' levels are different from Sonic's and Tails' in most cases, with new areas and bosses. There are slight differences in object placement in some of the Sonic 3 Zones (Launch Base especially). Sonic and Tails skips the final boss of Launch Base, while Knuckles still has to do it (although he skips the first true boss of Launch Base). Sonic & Knuckles levels are the same, with one exception: the Mushroom Hill Zone is slightly extended at the beginning, has one supplementary Giant Ring (or, in Knuckles' case, two), and gets an intro to tie the level to Sonic 3's Launch Base Zone (Sonic is airlifted in by Tails, Knuckles falls down after having jumped from an exploding platform). Here is a list of the music featured in Sonic 3 & Knuckles, as it is located in the sound test, which can be accessed by entering the zone select code. This page was last edited on 17 January 2019, at 11:58.